An enzyme (in Greek en = in and zyme = blend) is a protein, or protein complex, that catalyzes a chemical reaction and also controls the 3D orientation of the catalyzed substrates. Like any catalyst, enzymes work by lowering the activation energy of a reaction, thus allowing the reaction to proceed to its steady state or completion much faster than it otherwise would; the enzyme (again, as with any catalyst) remains unaltered by the completed reaction and can therefore continue catalysis. It is important to note that, as with all catalysts, all reactions catalyzed by enzymes must be 'spontaneous' (containing a net negative Gibbs free energy), i.e. with the enzyme, they run in the same direction as they would without the enzyme, just more quickly; the concept is similar to the likelihood of a ball rolling down a hill versus the likelihood of it rolling up the hill. Catalysis by an enzyme is analogous to removing a pebble that is stopping the ball from rolling down the hill; the reaction goes to completion more quickly, but the final product is identical. Given a particular starting set of conditions, the end products of a particular reaction (including net energy), once steady state is reached, must always be identical, independent of the specific individual pathway taken from beginning point to end point. This is required by the Law of Conservation of Energy, which would be violated by the possibility of a cycle of moving down a pathway releasing less net energy and back up a different pathway with higher net energy, or vice versa. An enzyme can, however, run a normally nonspontaneous reaction 'backwards' by coupling it to a spontaneous one, as long as the net free energy from the total of both reactions is negative. Enzymes are necessary within biological cells to control molecular shapes and because many chemical reactions would occur too slowly to sustain life; oxidation of organic food compounds to provide energy, for instance. Enzymes may speed up biochemical reactions by a factor of one thousand times or more. They also provide a means to control the reaction rates by modulating enzymatic activity. Figure 1: Diagram of a catalytic reaction, showing the energy needed at each stage of the reaction. The substrates (A and B) normally need a large amount of energy to reach the transition state, which then reacts to form the end product (AB). 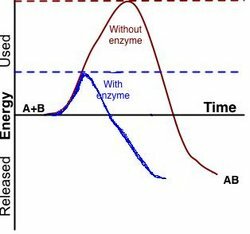 The enzyme forms a microenvironment in which A and B can reach the transition state more easily, reducing the amount of energy required. Since the lower energy state is easier to reach and therefore occurs more frequently, as a result the reaction is more likely to take place, thus improving the reaction speed. An enzyme can be a monomeric protein made up of about hundred amino acids or more, or an oligomeric protein consisting of several monomers, different or identical, that act together as a unit. As with any protein, each monomer is actually produced as a long, linear chain of amino acids, which then folds up in a particular fashion to produce the correct three-dimensional product. The factors that go into ensuring that the chain folds correctly and maintains its shape are complex, and still not completely identified, although the general principles seem to be understood. A single enzyme molecule might consist of just one or of several of these monomers, either identical or different. The final enzyme molecule might also be modified in various ways to make it active; for instance, chymotrypsin, a digestive proteases, is produced in inactive form as chymotrypsinogen in the pancreas and transported in this form to the stomach where it is activated. This prevents the enzyme from harmful digestion of the pancreas or other tissue. This type of inactive precursor to an enzyme is known as a zymogen. An enzyme contains of one or more binding sites where the substrate(s) attach, and active site(s), where the amino acids perform the catalysis; and frequently one or more other binding sites that serve regulatory functions, which increase or inhibit the enzyme's activity. These may typically bind metals or small molecules, often direct or indirect products of the reaction catalyzed. This provides a means for feedback inhibition to maintain a steady supply of the product despite varying conditions. As a consequence of this basic structure, the amino acid chain of an enzyme tends to consist of one or more active regions, separated by stretches whose purpose is mainly to position the active regions correctly. Because the precise structure of each region tends to be fairly critical to correct function, and because the frequency of a mutation which would produce a nonfunctional active region is proportional to the length of the chain separating the amino acids involved, evolution works against having the amino acids from an active region widely dispersed, instead tending to keep the amino acids involved in each active region compacted fairly closely together in the chain and conserved against mutation, separating these regions by long stretches of 'spacer' amino acids where mutation is much less critical (although some mutations in these regions can also inactivate the product). This has the additional effect of making each region act, relative to mutation, somewhat like an independent subunit which can be duplicated, deleted, moved, or 'mixed-and-matched' with other such regions, generating new proteins to be tested for evolutionary success. This would seem to be a more efficient process in terms of the likelihood of successfully generating functional new enzymes than would having the functionally related amino acids of the active site widely dispersed throughout the amino acid chain, with random mutation occurring anywhere. Enzymes can couple two or more reactions, so that a thermodynamically favourable reaction can be used to "drive" a thermodynamically unfavorable one, in effect running the reaction 'backwards', or 'uphill'. For instance, the high energy compound ATP is generated in the cell by coupling its synthesis to the oxidation of sugars, which releases more energy than the syntehsis of ATP requires; then the ATP is broken down in turn by other enzymes coupled to other processes, releasing the energy stored in it in order to drive other, otherwise energetically unfavorable, chemical reactions. This is analogous to raising a heavy object by attaching it to a rope that goes over a pulley and attaches to a weight which is lowered; the second weight must be heavier, in order that the net energy balance of the sum of both actions is favorable (i.e., net energy in the system is lowered). In a very similar fashion, an enzyme can cause an easily reversible reaction to become essentially irreversible, by coupling it to another, energetically unbalanced reaction. As with any catalyst, an enzymatic pathway does not intrinsically change the reversibility or irreversibility of a reaction. The direction of any chemical reaction is based only on the energy balance between the two sides of the reaction equation, and if there is very little change in net free energy between the substrates and the products, the reaction will normally be easily reversible, running in either direction depending on which side of the reaction was more highly concentrated. However, enzymes provide a means to make such a reaction much less reversible, by coupling the reaction to one with a large release of energy. This is analogous to an object sliding freely on a flat surface; the object may be pulled in one direction by attaching it to a rope attached to a hanging weight. In order to lower the total net energy, the system will drive the coupled reactions in one direction. Enzymes can increase reaction rate by favoring or enabling a different reaction pathway with a lower activation energy, making it easier for the reaction to occur. The overall rate of enzyme mediated reactions depends on many factors. Figure 2: An enzyme catalyzes the reaction of two substrates to form one product. Enzymes are usually specific as to the reactions they catalyze and the substrates that are involved in these reactions. Complementary structural properties of the enzyme and substrate are responsible for this specificity (Fig. 2). Enzymes can perform up to several million catalytic reactions per second. To determine the maximum speed of an enzymatic reaction, the substrate concentration is increased until a constant rate of product formation is achieved. This is the maximum velocity (Vmax) of the enzyme. In this state, all enzyme active sites are saturated with substrate. This was proposed in 1913 by Leonor Michaelis and Maud Menten. Since the substrate concentration at Vmax cannot be measured exactly, enzymes are characterized by the substrate concentration at which the rate of reaction is half its maximum. This substrate concentration is called the Michaelis-Menten constant (KM). Many enzymes obey Michaelis-Menten kinetics. The efficiency of an enzyme can be expressed in terms of kcat/Km. The quantity kcat, also called the turnover number, incorporates the rate constants for all steps in the reaction, and is the product of Vmax and the total enzyme concentration. kcat/Km is a useful quantity for comparing different enzymes against each other, or the same enzyme with different substrates, because it takes both affinity and catalytic ability into consideration. The theoretical maxium for kcat/Km is about 108 to 109 (mol/L)-1s-1. At this point, every collision of the enzyme with its substrate will result in catalysis. Some enzymes, such as fumarase, actually approach this limit. 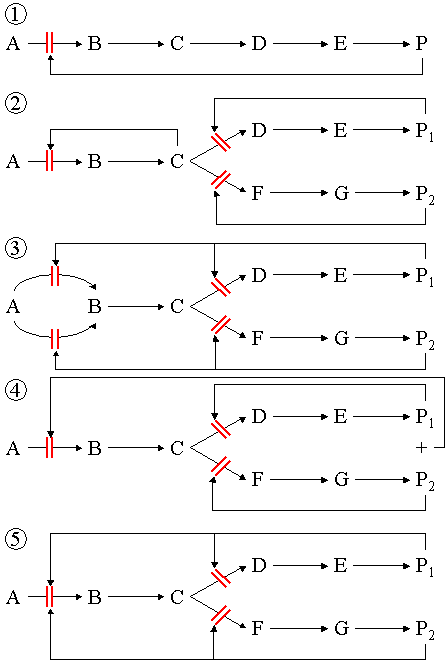 Figure 3: Common feedback inhibition mechanisms, (1) The basic feedback inhibition mechanism, where the product (P) inhibits the committed step (A->B). (2) Sequential feedback inhibition. The end products P1 and P2 inhibit the first committed step of their individual pathway (C->D or C->F). If both products are present in abundance, all pathways from C are blocked. This leads to a buildup of C, which in turn inhibits the first common committed step A->B. (3) Enzyme multiplicity. Each end product inhibits both the first individual committed step and one of the enzymes performing the first common committed step. (4) Concerted feedback inhibition. Each end product inhibits the first individual committed step. Together, they inhibit the first common committed step. (5) Cumulative feedback inhibition. Each end product inhibits the first individual committed step. Also, each end product partially inhibits the first common committed step. Several enzymes can work together in a specific order, creating metabolic pathways. In a metabolic pathway, one enzyme takes the product of another enzyme as a substrate. After the catalytic reaction, the product is then passed on to another enzyme. The end product(s) of such a pathway are often inhibitors for one of the first enzymes of the pathway (usually the first irreversible step, called committed step), thus regulating the amount of end product made by the pathway. The lecture "Quantum Theory of some Biochemical Reactions", presented to the IV International Biophysical Congress (Moscow, 1972) by R.R. Dogonadze and Z.D. Urushadze, formulated the first quantum mechanical model of the simplest form of enzyme catalysis. In 1972-1973, in the works of M.V. Volkenshtein, R.R. Dogonadze, A.K. Madumarov, Z.D. Urushadze and Yu.I. 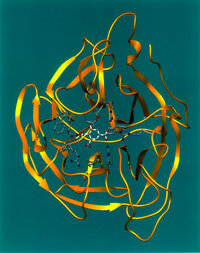 Kharkats were formulated the quantum-mechanical (physical) model of Enzyme Catalysis. These works demonstrated the role of conformational transformations in catalytic reactions. An RNA enzyme or "ribozyme" is made of RNA instead of protein. Generally, ribozymes only catalyze RNA splicing, though one notable exception is the RNA portion of the ribosome, which catalyzes the formation of peptide bonds in growing protein chains. Enzymes are essential to living organisms, and a malfunction of even a single enzyme out of approximately 2,000 types present in our bodies can lead to severe or lethal illness. An example of a disease caused by an enzyme malfunction in humans is phenylketonuria (PKU). The enzyme phenylalanine hydroxylase, which usually converts the essential amino acid phenylalanine into tyrosine does not work, resulting in a buildup of phenylalanine that leads to mental retardation. Enzymes in the human body can also be influenced by inhibitors. Aspirin, for example, inhibits an enzyme that produces prostaglandins (inflammation messengers), thus suppressing pain and inflammation. Enzymes are also used in everyday products such as washing detergents, where they speed up chemical reactions involved in cleaning the clothes (for example, breaking down blood stains). Nutrition in animals relies on digestive enzymes such as salivary amylase, trypsin and chymotrypsin. Their primary role is for the digestion of food and making nutrients available to all of the body processes which need them. Another class of enzymes is called metabolic enzymes. Their role is to catalyze chemical reactions involving every process in the body, including the participation of oxygen. Most of our cells (an exception being erythrocytes), would literally starve for oxygen even with an abundance of oxygen without the action of the enzyme, cytochrome oxidase. Enzymes are also necessary for muscle contraction and relaxation. The fact is, without both of these classes of enzymes, (digestive and metabolic) life could not exist. Since enzymes are proteins, enzyme purification begins with protein purification. Each step in the purification procedure is monitored for enzyme activity. One caveat is that proteases (enzymes that digest proteins) can be expected to start digesting themselves as they become more concentrated unless their activity is inhibited somehow; in a similar vein, purifications of other enzymes that begin with a preparation containing a protease will often result in loss of the enzyme being purified unless the protease is inhibited or inactivated. The word enzyme comes from Greek: "in ferment". As early as the late 1700s and early 1800s the digestion of meat by stomach secretions and the conversion of starch to sugars by plant extracts and saliva were observed. Studying the fermentation of sugar to alcohol by yeast, Louis Pasteur came to the conclusion that this fermentation was catalyzed by "ferments" in the yeast. In 1897, yeast extracts were used to ferment sugar independent from the living yeast cells by Eduard Buchner, proving that the fermentation was caused by molecules that functioned even outside the cells. He called these molecules enzymes. Weizmann Institute's Genecards Database (http://bioinformatics.weizmann.ac.il/cards/), extensive database of protein properties and their associated genes.